We’re on Phil and Christina’s boat on our way to Boston when Christina announces to a couple of us that she made a playlist that we’re going to love to listen to during our trip down the Charles River. 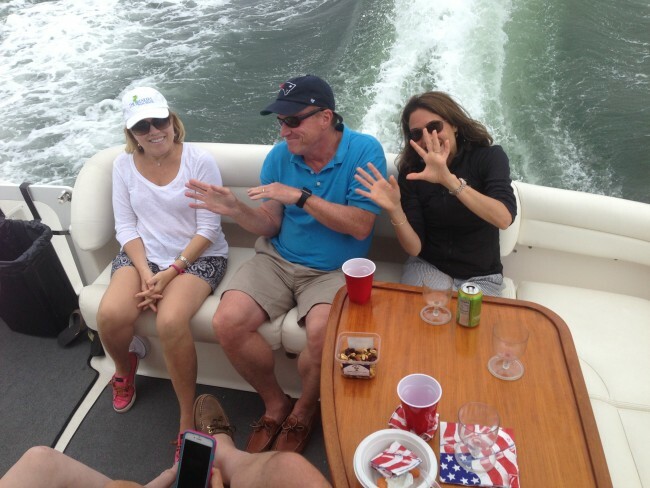 She fiddles with her phone, plugs it into the boat stereo system and boom . . .
We jump from there to 1982 and a club that I shouldn’t be allowed into (I’m 17) but my date and I have fake IDs and we mostly want to go to this place because we love to dance. As we pass the bouncer a little too easily, Toto’s “Africa,” is blasting out of the loudspeakers. Back on the boat in 2015, Christina is looking at me and laughing. Maybe she’s not looking at me, maybe she’s looking at Laurie who is dancing or she is simply happy, but her laughter brings me back into myself, and I realize I’m singing out loud with the music. And I know all of the lyrics. I laugh too, and then, I continue singing. I can’t help myself. That misty vision of my teenage years begins to brighten and become more defined. Even as the memories rush in, I am tapping my feet and singing each song, barely missing a word. We go through Bon Jovi and Doobie Brothers and Earth Wind and Fire and Michael Jackson and Billy Joel and Elton John. And more. Many more. Peter Framptom! Journey! Supertramp! Fleetwood Mac! Steely Dan! How many lyrics can one person store inside her brain before she explodes? It has to be pretty large because I also knew all the words to the music by Boston and ABBA and Stevie Wonder and Phil Collins too. The fireworks on July 4th eve were great to watch over Marblehead harbor, as they always are, but this year they were not the highlight of my day; instead, it was Christina’s playlist that set my world on fire. Music is one of life’s true pleasures. Reading your blog and knowing how much happiness a throwback playlist can bring, and now I know brought to you, is making me smile from ear to ear! I will hold this years 4th as one of my favorites too for that very reason! And now I can listen to it on Spotify ALL THE TIME! I am singing along now — even though we missed the boat I can hear the music. “Oh What a Feelin”!! Ooops! I meant “More than a Feeling” — BOSTON. Oh What A Night! Great September back in 63. What a very special time for me. . .